How do I connect my product with a Wi-Fi Direct connection? You can enable Wi-Fi Direct mode to allow direct communication between your product and computer or other devices without a wireless router or access point. Press the arrow buttons to select Wi-Fi Setup and press the OK button. Select Wi-Fi Direct Setup and press the OK button. Press the right arrow button to select Yes and press the OK button. Note: If you have already connected devices or computers to your product via Wi-Fi Direct, they will be disconnected when you change the password. Enter your new Wi-Fi Direct password. 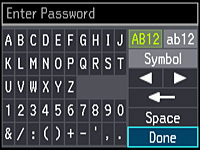 Note: Your password must be at least 8 and no more than 22 characters long. Press the arrow buttons to highlight a character or a function button displayed on the keypad. Then press the OK button to select it. To change the case of letters or select symbols, select AB12 (uppercase), ab12 (lowercase), or Symbol and press the OK button. Then highlight a number or symbol and press the OK button to select it. To enter a space, select Space and press the OK button. To delete characters, select the back arrow and press the OK button. When you finish entering characters, select Done and press the OK button. 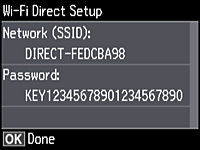 Use your computer or wireless device to select the Wi-Fi network name (SSID) displayed on the LCD screen, then enter the password shown. Press the OK button to exit. You see the connection symbol on the LCD screen and should be able to print directly to your product from your computer or device. Note: If the connection symbol is not displayed on the LCD screen, Wi-Fi Direct mode is not enabled. Repeat these steps to try again. Published: Aug 1, 2016 Was this helpful​? Thank you for the feedback!